Some of the kids have been a bit troublesome lately. Here is one incident from today. One of the Year 8 boys, ‘Fred’, was somewhat vexatious today. It was English class, and I saw him writing his Chinese homework on a sheet under his English book, so I took it away and gave him a warning. Five to ten minutes later I saw he had a Chinese book on top of his English book! So I confiscated that too, and told him to see me after class. We have a 10 minute break between each class (so the kids can run around and burn off energy, and teachers can finish all matters with teaching, etc), so I got him to bring his English books and a pen to the English office, and he sat and did some English to make up for the time lost by doing Chinese in English class. At the end, I spoke to him and he understood the punishment and its reason. I also asked him to apologise (’Sorry Miss Gail for doing Chinese in English class’). He understood what I was asking him to do and why, but stood there, looking at me defiantly. I told him that he could apologise, or I’d speak to his homeroom teacher. He didn’t, so after the next lesson, I did just that. I explained the situation to my Chinese English Teacher who could tell him off properly in Chinese, which he did. In the course of the next half an hour, Fred refused to apologise point blank. At one stage he offered to write double the lines I’d set him (as part of a separate punishment for earlier in the week - he completely ignored me when I asked him to stay behind after the lesson and finish his classwork) instead of apologising. I explained this was unacceptable, as writing lines is easy compared to telling someone you were in the wrong. He also wanted to learn English his way, by ’sitting in class and not listening to the teacher, but reading books and learning English that way’. ?!?!?! I couldn’t believe anyone would suggest something that. And still he refused to verbally apologise. About 25 mins into all this I’d had enough, and told him that he had the choice of apologising to me there and then, or he, the Chinese English Teacher and myself would call his parents, and he would have to explain the situation to them. He gave his Dad’s work phone number and we went to the English room to call him, when the lady who teaches the Foreign English Teachers Chinese was in the office. My Chinese English Teacher explained the situation to her and she said she’d handle it (she’s the official behaviour-type person). Ten minutes later I was given a very nice apology. When discussing this later with the other FE Teachers, they said that the boys in the Year 8 class had a problem with apologising for some reason, and thought this stemmed from a Chinese teacher in one of their previous years, who never demonstrated this trait. They also told me of another of the Chinese teachers, who had prize-winning Chinese language students he/she was very proud (and boastful) of, instructing their students to do their homework in English class. Strange but true. It goes to show that actions often speak louder than words. Well, I’ve decided to take a bit of a survey of my health. I consider myself generally blessed with a very sturdy constitution, and get sick infrequently. This has been true for our time in Shenzhen, with the exception of my throat, for some reason. Since beginning school, especially, I’ve had things ranging from mildly irritated to quite sore throats to almost being incapable of talking. They have furthermore been much more frequent than I’d like. Because of this latest occurrence I’ve decided to keep notes on the calendar to have a proper record of them. It will be interesting. I’ll keep you posted. The contaminators are about 3 feet high, have cheeky smiles, are of Asian appearance, love seeing and touching Miss Gail at any opportunity, and are found at the Kindergarten. I’ve noticed that every day I’ve taught for the last 8 weeks or so, there are at least a couple of kids with ‘red tags’ by their names because of sore throats/ infections. I wash my hands before eating, but there seems only so much you can do to keep the germs at bay. I guess ‘what doesn’t kill us makes us stronger’ (but as Pratchett fans will note, ‘what does kill us leaves us dead’ ’ . PS. It seems that Andrew now has it. I was on the receiving end of a pick-pocket attempt on Friday. Apparently Shenzhen has the highest number of pick-pockets in all of China. I’ve heard about so many occurrences of pick-pocketing, now it was my turn. I was on my way to Hong Kong for the day. I’d popped into the Shenzhen office to pick up something and I was descending down the escalator to return to the Metro. I had a small backpack on my shoulder. Most of the people were standing to the right so I walked down the escalator on the left hand side, rather quickly as I didn’t want to waste time. As I approached the bottom of the escalator I took a longer step off the bottom. As I did so I felt a slight tug on my backpack. I immediately spun around to see a guy drawing his hand away from my backpack and the front pocket wide open. I looked down to check if anything had been taken (which was only a few business cards) but it had not. I glared back at this guy. My instinct was to smack him across the face with the back of my hand but I restrained myself. I just stared back in shock. He stared at me, completely expressionless, looking like C3PO with skin. He then smoothly stepped back and away and merged with the flow of people heading back up the adjacent escalator. I continued on my way. I was angry about this for 2 reasons. The first was that what I had was not his to take. When justice is absent, immorality reigns. I came within a whisker of dispensing my own justice on this guy. The second reason was that none of the 30 or so people on the escalator or in the vicinity said or did anything before, during or after the pick-pocket attempt. It was as if we weren’t there. This is probably a cultural loss-of-face thing. I’m always very careful with backpacks as they are prime targets. I always have the zips to the front and on the side, under a strap if possible. You never can be too careful. The other week I had my Open Class. All teachers are required to give one Open Class per semester, for the purpose (I think) of other teachers to see how you teach, and to constructively criticise and get tips on how to do different things. It went quite well. I’d chosen the Year 9s, because they are the most stable and mature class, and easiest to work with. - good enough reasons for me. The Year 7s and 8s are still hit-and-miss some days; you get your good days and unproductive ones. The year 9s, with about 13 girls and 3 boys, are an extremely girly class, who love the group-work, and can do on-task group-work; a sufficiently rare occurrence for any Year 9s. They are also self-motivated, with their end-of-year exam being pressured like our Year 12. With 10 or so teachers at the back of the class, the kids were much less chatty than usual, which made things slightly harder, and I felt a bit uneasy too, which was frustrating. I gave them a hard comprehension, that had quite a few words they wouldn’t know, for the purpose of teaching preview techniques. The whole thing went very well, though they were not quite themselves, which made things a little harder and less enjoyable than a normal class. The subsequent lesson they were back to normal, though. An interesting part of the process was feedback. I received feedback from the ‘official feedback-giver’, a Chinese English Teacher, and also from the Foreign ETs who came. Interestingly, the FETs said that most of the CETs probably wouldn’t be able to understand the lesson, as the material was difficult; a comment I thought justified when meeting with the official responder. Another amusing thing was that these open classes are usually shows, with lots of interesting things, and I heard that some Chinese teachers also teach the whole lesson to the class before-hand, so there are no surprises!! Hardly representative of real life. So the FETs all imagined that a few were surprised that this was a normal lesson. Hee hee! Maybe it will start a trend of real-lesson Opens. 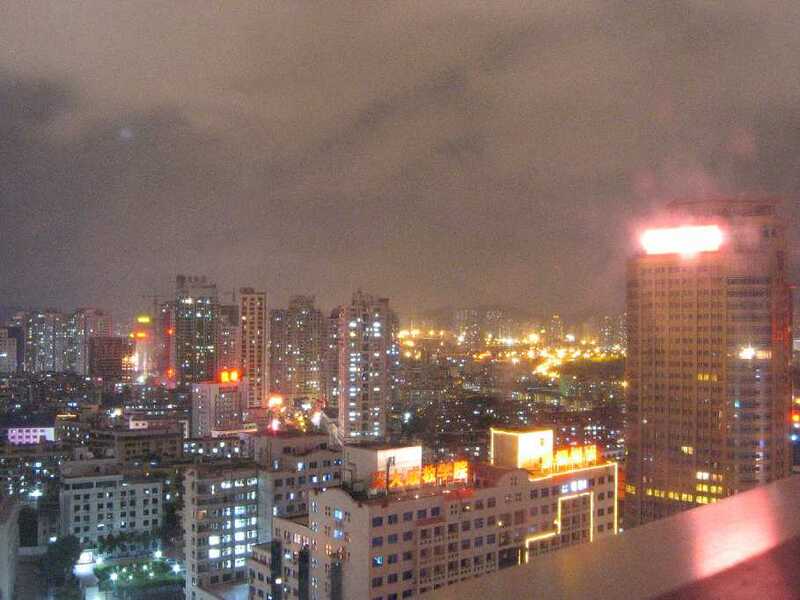 Shenzhen is one of those cities that never sleeps. We should know - our apartment is on the main road running east-west through the city. The photo above was taken at about 11pm and just look at all the lights that are still on. The city glows around the clock regardless of the day of the week. This all means that getting a good night’s sleep requires blocking out the light from nearby buildings and blocking out the background noise of the traffic. 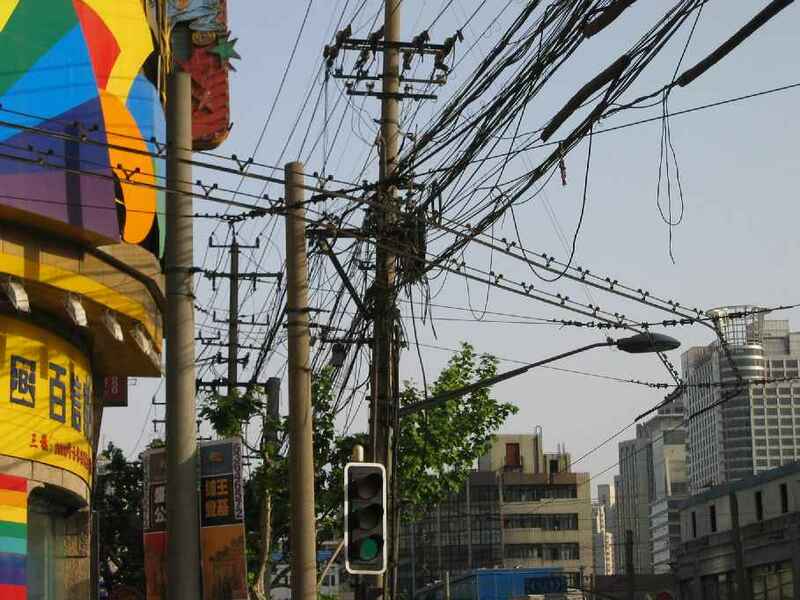 Anyone feeling like using a Chinese electrical contractor for some work around the home? Anyone volunteering for fault-finding? I took this photo whilst on holidays in Shanghai. What a mess. Some of the busses in the streets are electric. They connect to the electrical rails by two long sping-loaded sliding hooks, further contributing to the overhead chaos.